In Japan, it is much warmer and more comfortable. 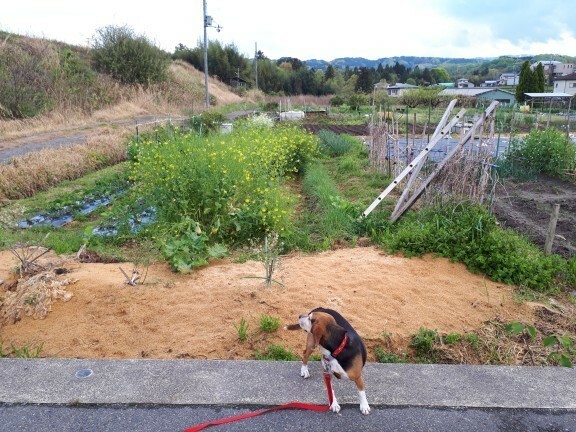 Spring has come! I visited the Ueno park in Tokyo in the middle of last month. The Ueno park has very beautiful sakura(cherry blossoms). I couldn't see them in bloom then, but a lot of people are enjoying sakura in full bloom now. 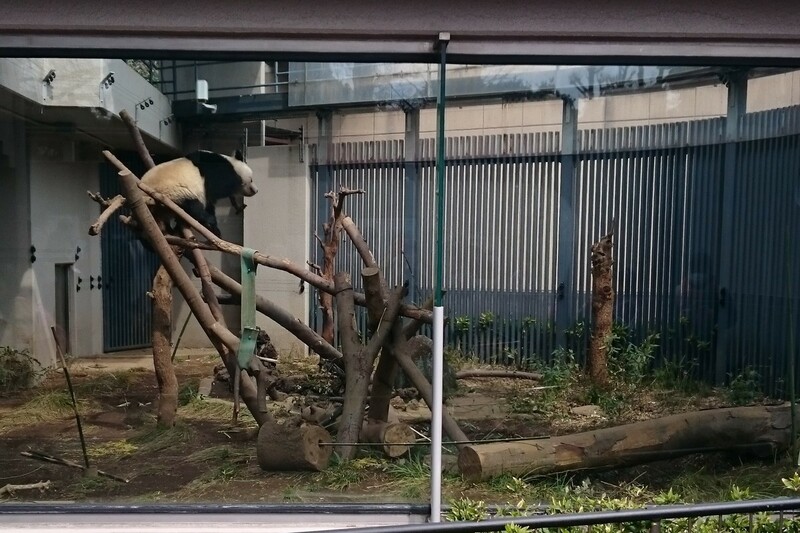 By the way, I went to the Ueno zoo to see pandas. I like pandas because their color is cute. I can't believe there are animals that have such strange colors. In the Ueno zoo, a baby panda was born in 2017. Her name is Xiang Xiang. People were very exciting at the news in Japan then. I could only see her for a minute. There was a very long line to see pandas and the waiting time was 30 minutes though it's been two years since the news of her birth. Pandas are loved by a lot of people. The only thing is that she kept still. I tried taking a video, but I found there was no meaning. I'm glad to see her growing well anyway. I think the pandas know that they are cute and loved even if they do nothing. 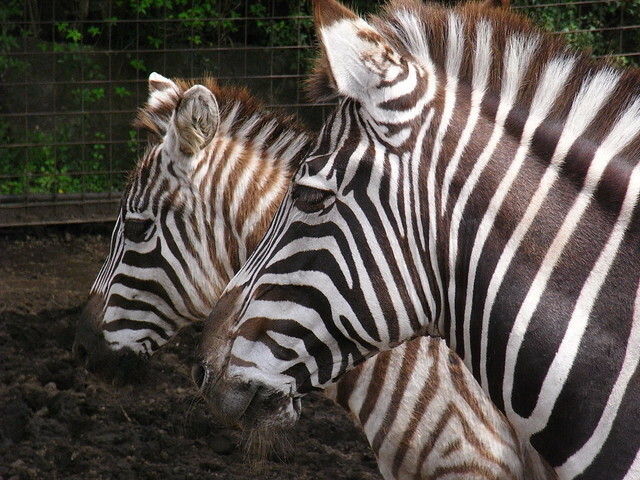 The other animals were active and cute. 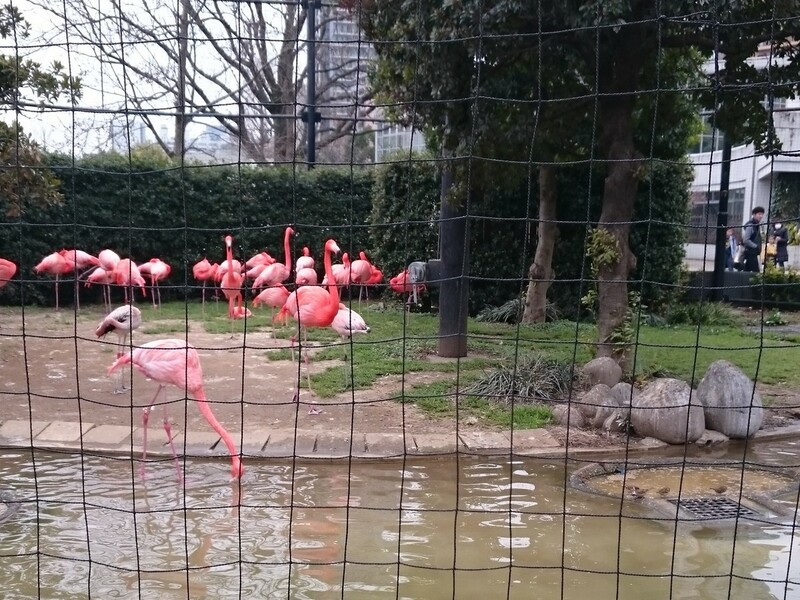 There were beautiful flamingos! Speaking of flamingos, we make obis with pretty animals such as flamingos, zebras, leopards and penguins. I hope you enjoy the unique items! Even it has SOLD mark, obi can be available if you could wait for 1-2 weeks. Contact us if you are interested in purchasing this obi. Dear Ichiroya news letter readers How are you doing? This time Iori is writing. 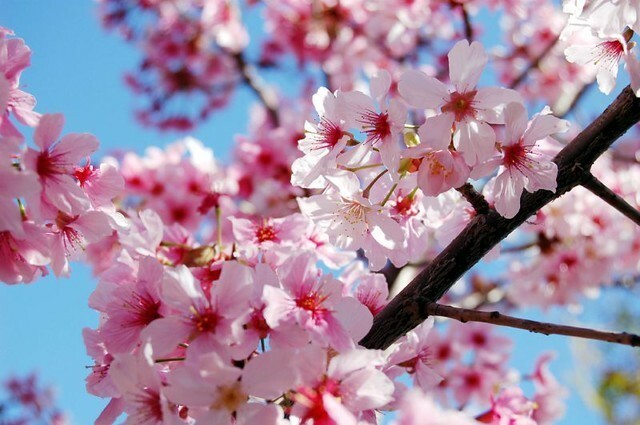 'Sakura'(cherry blossoms) is in full bloom in Japan. I hear lots of songs including 'sakura' phrase from the radio these days. I went to Hanami(Sakura viewing) the other night. 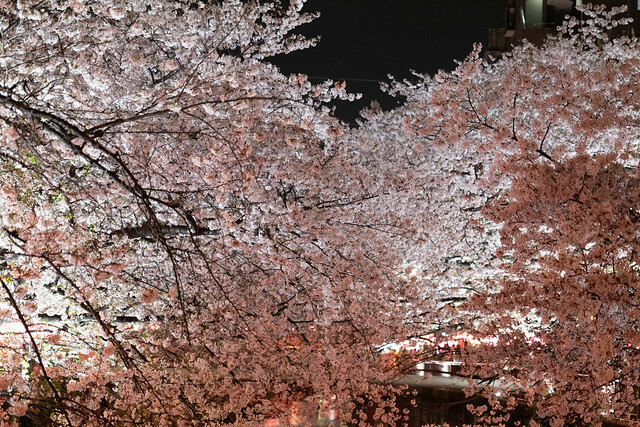 In this season, sakura trees are illuminated by lanterns beautifully at night. People are sitting down under the trees and have a party after work. That is a well-known scene in Japan. I watched the TV and it said many foreigners enjoy Hanami in late years. Beautiful sakura with yummy Japanese foods and drinks! Sounds nice, doesn't it? I recommend you to come and enjoy viewing sakura in Japan. We don't enjoy only seeing sakura but also eating the flowers. 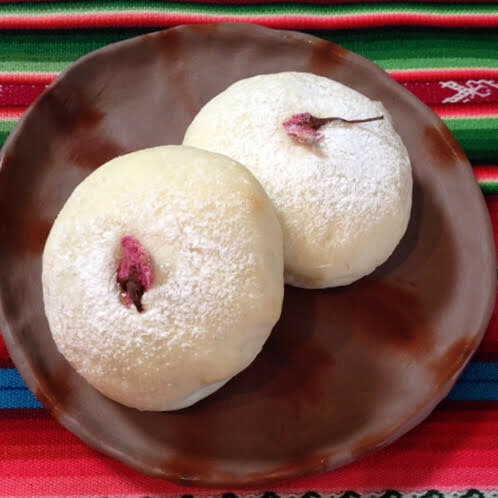 I use salted sakura flower for cooking salad, baking cakes and breads or making soda as an accent. The pink color is beautiful to the eye and also it has good slight flower smell. Now you know how much Japanese love sakura! By the way, this Heisei era is ending in this April 2019 in Japan, and that means the Emperor withdraws from the Throne. The name of new era name was announced the other day. 'Reiwa' is the name. It comes from 'Manyoshu'(Japanese poems). 'Reiwa' is '令和’in Kanji character. '令’means 'order', 'command', 'auspicious' and so on. '和' means 'peace', 'harmony' and so on. I think it is a beautiful name and new era will be better one for all of us. In Japan, we have about a week long holiday called "Golden week" every year at the end of April through beginning of May. This time it will be a little bit longer due to changing the era. Our office will be closed from April 27th through May 6th. During this holiday, no new items will be listed, and we won't be able to reply to any emails or process shipments. After sakura season, roses, 'hanamizuki'(flowering dogwood), carnations, poppies, 'fuji' (wisteria)... many fowers bigin to bloom one after another. 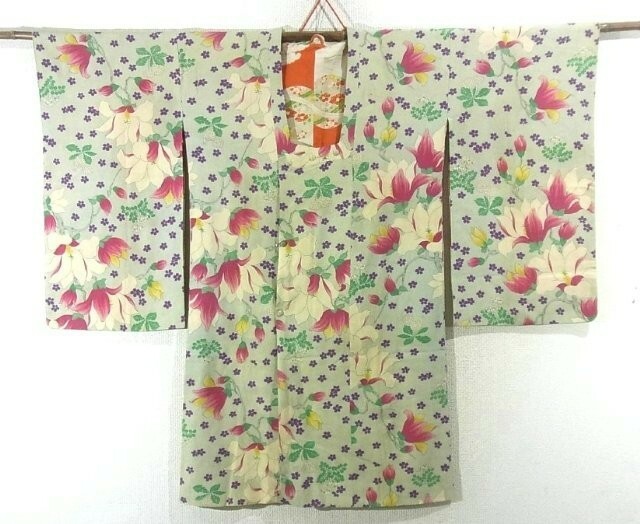 I will introduce Kimonos & Obis with flower motif. Thank you for reading till the end. Please have a nice weekend! Hello, this is Mari writing. at the end of April through beginning of May. It will be a little bit longer this time. Our office will be closed from April 27th through May 6th. reply to any emails or process shipments. The following newsletter contains images of insects. If you dislike insects, please be careful and browse!!! 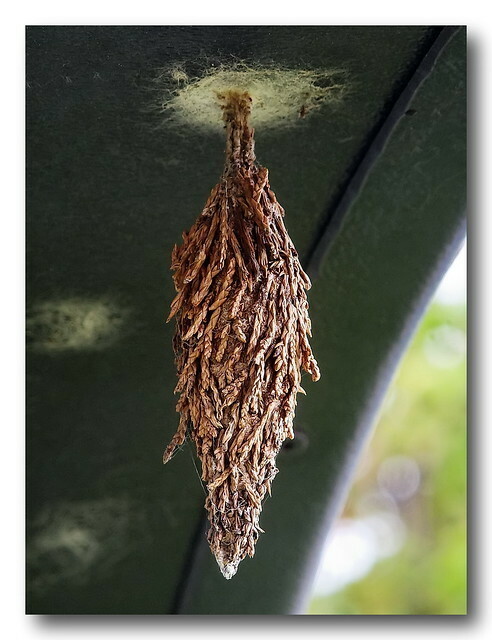 Have you seen "Bagworm" hanging on a branch or something? I used to see them at parks or my house's backyard when I was a child. I used to. When I was a child, I was curious about their ecology and unique look. done it though... Now, I see what's inside on internet. I knew it is a worm! 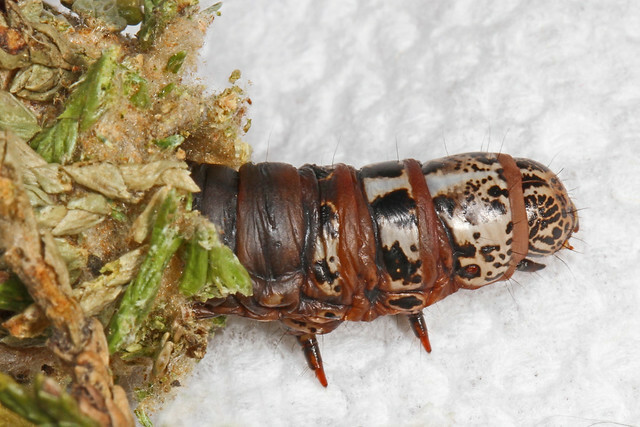 which use bagworm's shell to make pattern. They are very unique and tasteful! There is a workshop where they produce bagworm items. The following is the process of making a pattern with bagworm skin. There are so much work to make the tasteful items! Please take a close look at bagworm patterns we carry at this moment. To be honest, it's no exaggeration to say that I wrote this newsletter to show this item. Although it has been sold a while ago, I still remember how much shock I got when I saw it for the first time. The whole jackets were made of shells of bagworm! This is Yoko writing this week's newsletter. Hope Minasan is enjoying the last weekend of March. As many of you may already know, in Japan, new term or grade in schools or companies starts in April. Everything is a fresh start and new environment for some people soon. For those of you making a brand new start in Japan next week, dozo ganbatte kudasai!!! wherever you will stand!! Ouenshitemasu! A news arrived last week and shocked us all.. ... Ichiro Suzuki, a major league baseball player at Seattle Mariners announced his retirement. I am shocked but not disappointed. Until at age 45, he has tried really hard and did more than an amazing job away from his homeland. During his baseball carrier, he won Golden Glove 10 times and picked All-Star 10 times too!!! I am more than certain that his name will be remembered as a legend as long as there is a baseball!!! During his interview after the game on Friday, he was asked 'what was one thing you carried out throughout your baseball carrier? ', after thinking quietly, he said 'it was love for the baseball'. Kakkoii! His interview brought tears to my eyes though it was not a sad or regrettable interview at all. His baseball carrier ends in March... What would his April be like at age 45 now???? I would like to say, Otsukaresama Ichiro! Arigato Ichiro!!! 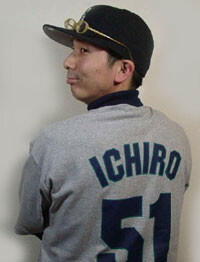 Oh by the way, ICHIROYA is not named after Ichiro Suzuki. It is named after our president, Ichiro Wada!!! coincidentally, same first name! hahaha!! Have you noticed a pattern of baseball has been one of the popular motifs in Japan?? We made this lovely obi in our facility!!! My personal picks of items with Sakura motif! Wishing you a happy and lovely weekend!!! Hello! This is Nagisa writing. How have you been? It's getting warmer and warmer day by day in Osaka. There are 'Mokuren'(magnolia) trees along the street in front of Ichiroya, and white and purple flowers began to bloom. When I see the scenery every year, I feel spring has come! Last week, I went to 'KANSAI COLLECTION 2019 SPRING & SUMMER' which is one of the largest fashion event in Japan. It's held twice a year at Kyocera Dome Osaka since 2011. Popular fashion icons are dressed in trendy clothes and walk on the runway, music artists liven up the show by their performance, and some companies take part in it to exhibit their own booth with new products and service. We can try them and get some gifts such as face mask, body wash and chocolate for free. The big dome was full of young ladies! It says that the number of the visitors was 44,000! It was my first time to go to such a huge fashion event, and I was surprised that YouTubers were very popular among young people. Then, I'd like to introduce you to the latest fashion applying Kimono items! Personally speaking, I often see tennis ball, racket or players motif items such as T-shirt, hat or jacket at some clothes sores lately. How about you? I secretly hope that tennis design will come into fashion because we also have tennis design items! By the way, I once worked at a book store in Osaka city, when I was s collage student. Then I've met Akiko Kikuchi who is my favorite fashion model. She was also chief editor of a fashion magazine. When she visited Osaka for the newly-issued magazine release event held at a clothes store, she kindly visited to our book store and autographed on stock of her magazine. It was the day after my trip to London, and I caught a cold then. However, I went to work admirably, and I can meet her and get her autograph with my own hands! This is my best memory during I worked there. Thank you for reading till the end. Enjoy Kimono fashion! Hello, this is Mitsue. How are you doing? March has already half passed and the season is turning to spring. I always feel depressed in the beginning of spring because of a hay fever. My eyes are itchy and my nose is running with sneezing. However, I find many kinds flower in spring, and it is exciting for me! 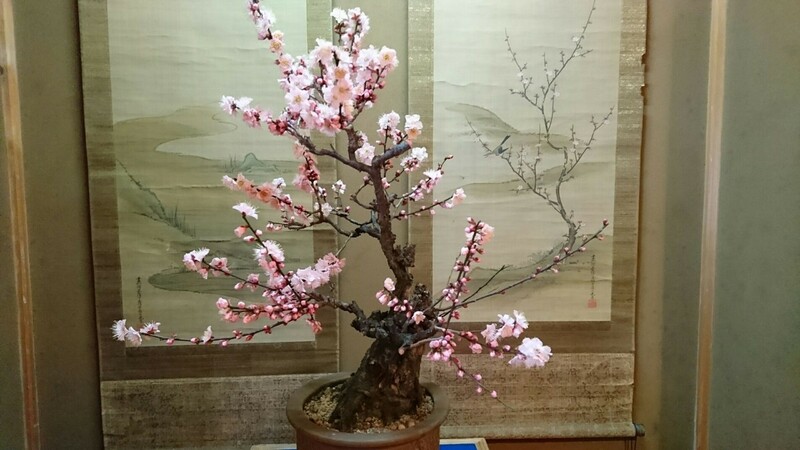 There was an 'Ume' (plum blossom) tray exhibition last month in Yamato-Koriyama ruined castle, Nara prefecture. Some buds were not open yet, but I enjoyed the display with hanging scroll. 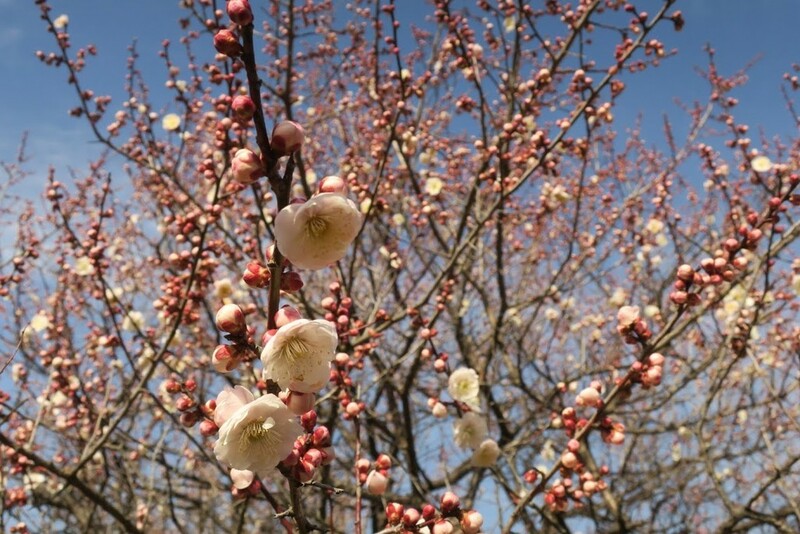 The pale hue of Ume were so charming that I felt relaxed. 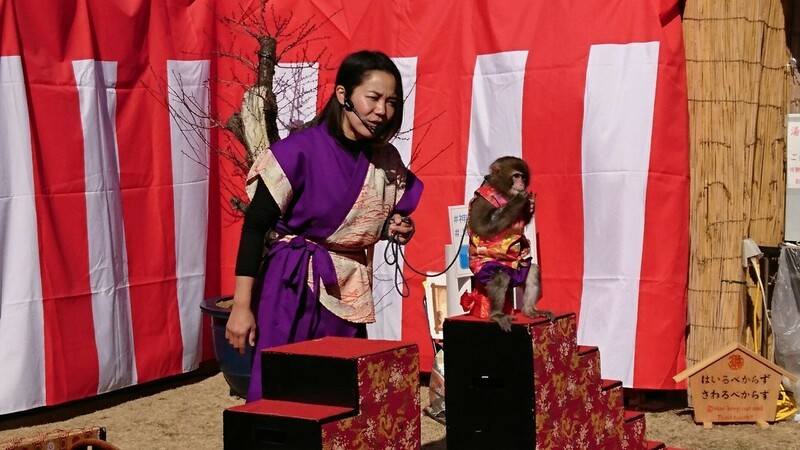 After enjoying the display, I watched Saru-mawashi(monkey show) in the garden. The monkey is a 6 months girl, and she played so cute jumping, rope-walking, walking on stilts and bowing. She seemed to be pleased with getting rewards such as apples. 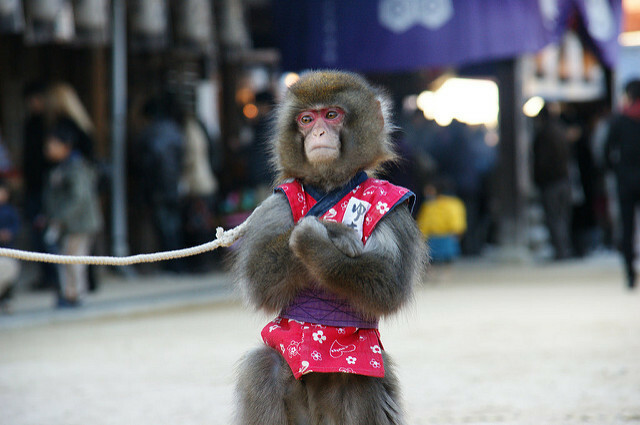 Saru-mawashi is a street performance handling 'Saru'(monkeys). It is held on special day such as New Year's day, festivals and happy events. 'Saru' also can be read as 'go away' in Japanese, so monkeys are said to be auspicious animal as 'bad things go away and get good ones'. The origin is in India, and conveyed to Japan in early Kamakura era (12c) through silk road. So Saru-mawashi was held to go away the disaster and sickness from people and horses. Horses were very important for war and supplies transportation, and Saru-mawashi was established as a job in Edo era(1603-1867). Now, it is held as performance for peoples's entertainment also at a theater and on TV. It is said training monkeys needs so much patience, because they use to live in a group and fight for a boss instinctively. So they sometimes become rebellious against human beings and become wild. So monkeys can play good performances by building up the relationship of mutual trust with trainers. On the way back to a station, I found an unique aquarium of gold fish in front of 'Konya'. It is an Ai dyeing craft continuing from Edo era, and it is now regenerated to a space which we can buy Ai items and experience Ai dyeing. 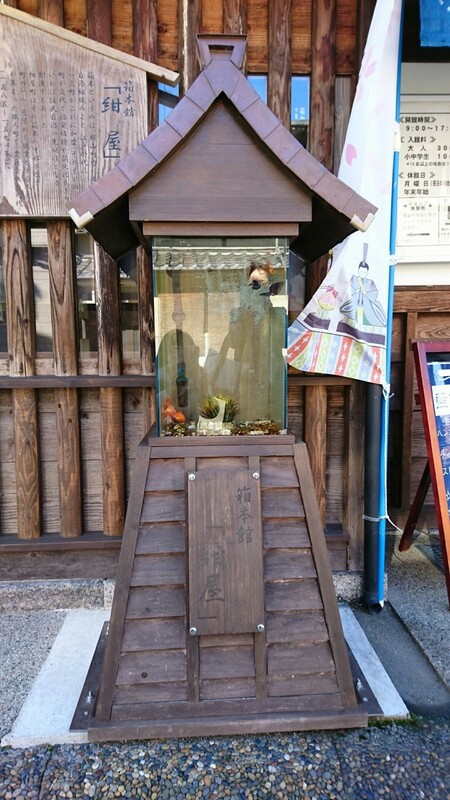 Yamato-Koriyama is also famous for goldfish aquaculture, and some events of goldfish scooping are held there. As for 'Konya', please refer to the HP below. Today, I introduce you some pieces with cute goldfish design. Thank you for reading. I hope you enjoy this weekend. 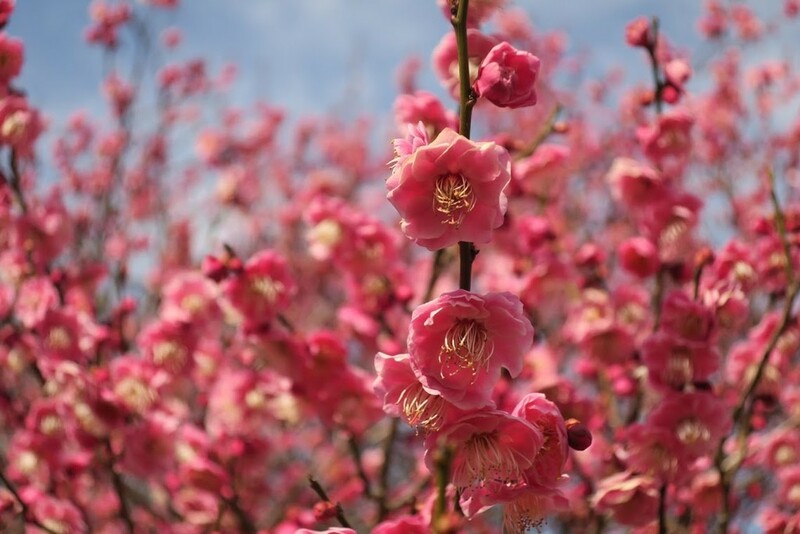 March has come, and 'Ume'(Plum blossoms) are in full bloom. 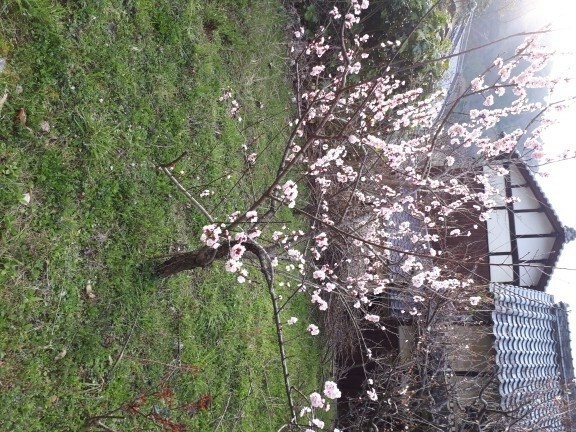 I am looking forward to 'sakura'(cherry blossom) blooming. The other day, I enjoyed Hinamatsuri (March 3rd, Girls' Festival). 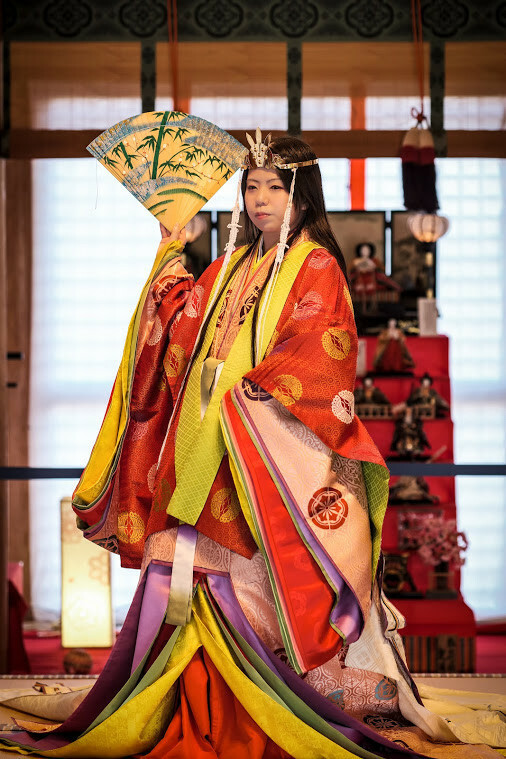 I have more opportunities to wear Junihitoe (twelve-layered ceremonial kimono) than other Japanese girls. This time, I wore Junihitoe (twelve-layered ceremonial kimono) just for fun. 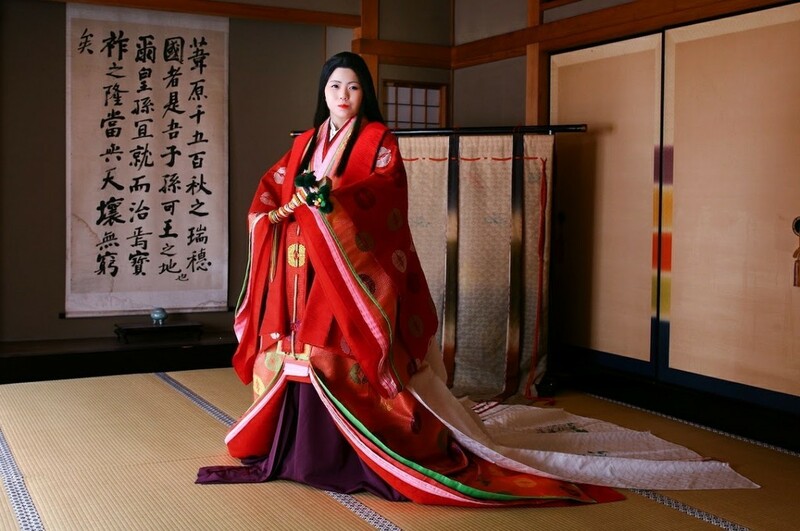 Junihitoe is translated as twelve-layered ceremonial kimono, but it is not so accurate. ‘Juuni’ of Junihitoe meas ‘Juunibun-ni (more than enough)’. So it does not mean the number of kimono. Many Japanese are misunderstanding that Juunihitoe is twelve kimono. This Junihitoe which I wore is tailored with attached layers of collar and hem(hiyoku). So it was light to wear. I wore Hibakama(red hakama) this time, but actually this is a dress for married women. It is wrong with formal rules of Shozoku (Japanese traditional clothes). Single women wear Koki-iro Hakama in its rule. Koki-iro is deep purple to reddish purple color. I wore Koki-iro Hakama for my Mogi (coming-of-age ceremony for girls of Heian). The Junihitoe was very heavy, and it was very hard to stand. 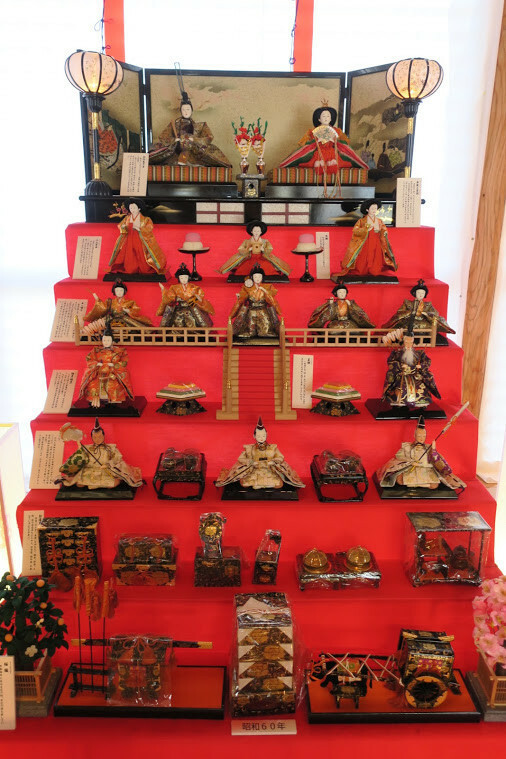 I have seven-tiered platform Hina doll (a doll displayed at the Girls' Festival), but I have no time to display it. I sometimes think that it is strange about Hina dolls. 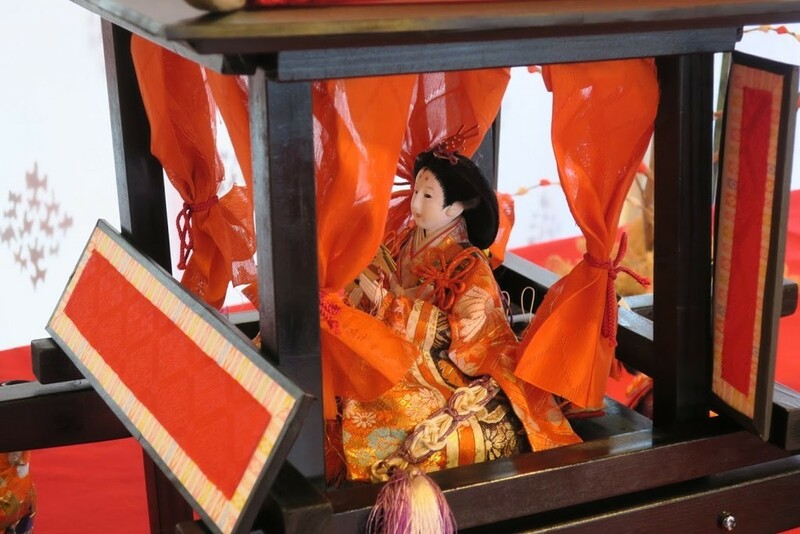 A princess of Hina doll wears the most formal Junihitoe, but court ladies wear semi-formal. 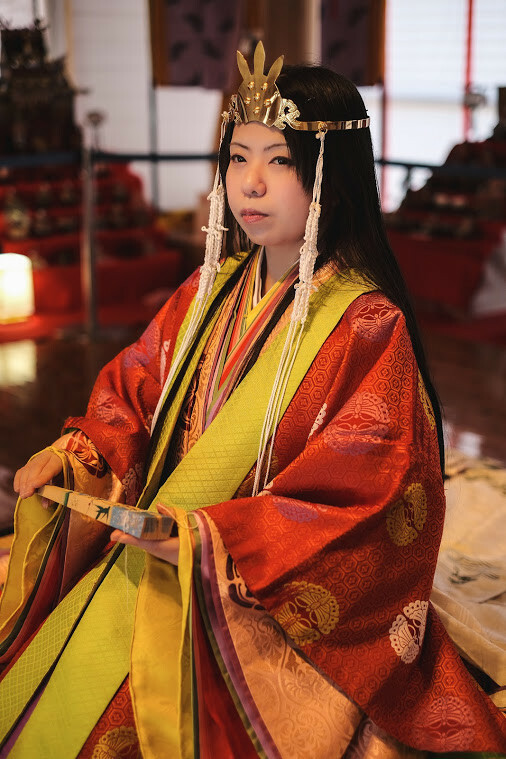 According to the rule from the Heian period, the upper person was allowed to wear light dressing. I think that Hina dolls are opposed to the original rules. And I have another question about Kimono. Red hakama is for married lady. 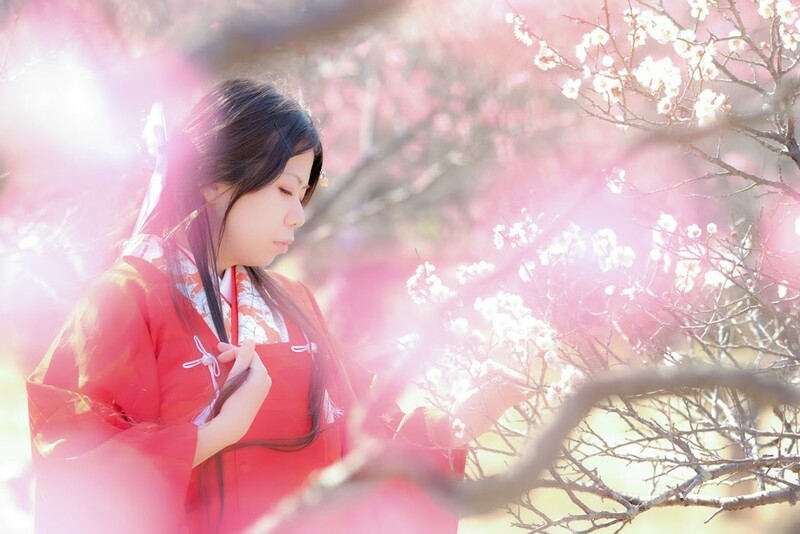 But currently, red kimono and obi are for young women or girls to wear, not for married, mature ladies. I think that the concept was opposite to the old days. I would like to recommend Heian style design.